The OpenNebula Conference is proud to announce the final line-up of speakers and the schedule for 2013. We had a big response to the call for proposals. Thanks for submitting a talk proposal!. Although all submissions were of very high quality and merit, only a small amount of abstracts will be presented. The Lightning Talk Session provides a new opportunity to submit presentation proposals. Do not forget to register as soon as possible since the number of places is limited. There is still time to take advantage of our early registration offer, which expires at the end of June. You can also take advantage of the available sponsorship opportunities which are a great chance to present your company with the leading open source datacenter virtualization solution. We are Looking Forward to Welcoming you Personally in Berlin! The OpenNebula Project announces the general availability of the first Service Pack for the OpenNebula 3 Series (3.8.4). After its first year, and for two additional years, the Project distributes a Service Pack (SP) for each major release that combines all the patches to easily install or deploy its last update. Service Packs allow users to maintain their current OpenNebula version as long as possible, preserving the stability and security of their data centers, as they transition from one OpenNebula Series to the next. This is a maintenance release that fixes bugs reported by the community after 3.8.3 was released. This release only includes bug fixes and is a recommended update for everyone running any OpenNebula 3.x, whom for any particular reason do not want to upgrade their cloud manager to the latest available OpenNebula version. The OpenNebula Project is proud to announce the final line-up of keynote speakers for the first OpenNebula Conference. In few days we will publish the Agenda of the event that will also include the talk proposals received, a hands-on tutorial, and several community sessions. As user of OpenNebula and member of its community you should be speaking at the first edition of the OpenNebula Conference in September in Berlin. The deadline for receiving talk proposals is Saturday, June 15th. We recommend submitting your proposal as early as possible at http://opennebulaconf.com/proposals/. Confirmed keynote speakers are from world’s leading corporate and research institutions. Jordi Farrés, European Space Agency, will speak about “Opening the Path to Technical Excellence”. The conference site will be updated to reflect new keynote speakers as they are confirmed. The Conference will serve as a meeting point for OpenNebula cloud users, developers, administrators, builders, integrators and researchers and a great opportunity to share experiences and network . Please register as soon as possible at http://opennebulaconf.com/registration/ since the number of places is limited. There is still time to take advantage of our early registration offer, which expires at the end of June. Sponsoring OpenNebulaConf is a great chance to present your company with the leading open source datacenter virtualization solution on the market. Find out more about our sponsoring opportunities at http://opennebulaconf.com/sponsors/. If you have any questions, please do not hesitate to contact us via contact(at)opennebulaconf.com or use the form at http://opennebulaconf.com/contact/. The goal is to get as soon as possible the new OpenNebula 4.0.1 to dev.centos.org. Your help would be very valuable! OpenNebula Cloud API: Amazon, OGF OCCI, OpenStack, Google Cloud, DMTF CIMI or vCloud? Last week we launched a survey to collect feedback from our community regarding what is their preferred interface for cloud consumers and how we should invest our resources in cloud API enhancement and development. 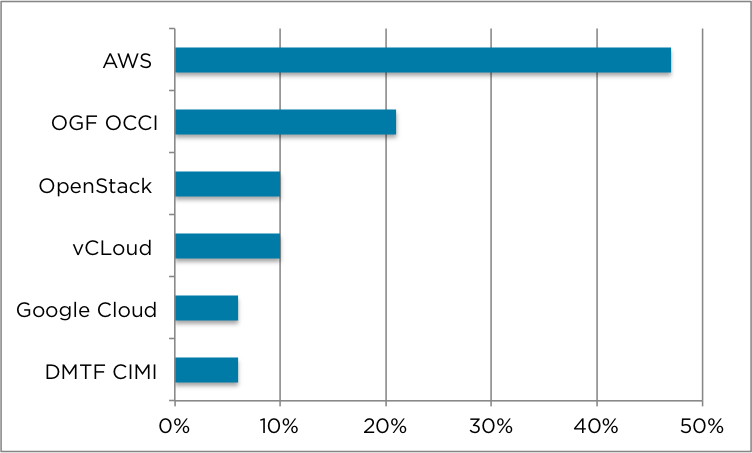 The survey was open for two days receiving feedback from almost 200 OpenNebula clouds. We also received many valuable additional comments mostly stating that “AWS is the de-facto standard and an executive-friendly selling point”, “OGF’s OCCI is the only independent community-driven standard”, “OpenStack API is still not stable and fully documented”, and “Google Cloud API represents a big opportunity in the medium term”. 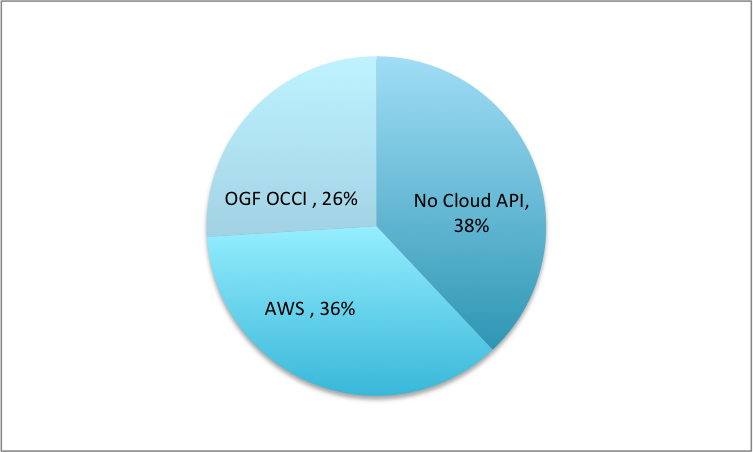 Guided by these results, our plans for the near future are to enhance and extend our implementation of the AWS API and to offer OCCI compatibility through the rOCCI component. Of course, if your organization is interested in implementing one the less demanded Cloud APIs, we can provide you with the needed support. https://opennebula.org/wp-content/uploads/2018/11/opennebula_cloud_logo_white_bg-4.png 0 0 Ignacio M. Llorente https://opennebula.org/wp-content/uploads/2018/11/opennebula_cloud_logo_white_bg-4.png Ignacio M. Llorente2013-06-06 13:11:422013-06-06 13:49:45OpenNebula Cloud API: Amazon, OGF OCCI, OpenStack, Google Cloud, DMTF CIMI or vCloud? The OpenNebula Project is proud to announce an expanded line-up of keynote speakers for the first OpenNebula Conference. The Conference, taking place from 24th-26th September 2013 in Berlin, will serve as a meeting point for OpenNebula cloud users, developers, administrators, builders, integrators and researchers and a great opportunity to share experiences and network with other projects. This first ever edition of the OpenNebula Conference will be hosted by open source specialist NETWAYS, which has long experience in the organization of events in the open source environment. OpenNebulaConf2013 offers a multi-day conference that includes hands-on tutorials, keynote speakers and several thematic tracks. Please fill in the proposal form to register your interest in presenting at OpenNebula Conference 2013. Deadline for talk proposals is the 15th of June. The OpenNebulaApps have catched up with OpenNebula 4.0. This new version comes with a new appearance, tailored to match the new Sunstone, and multiple bug fixes. The development department is working full steam on new OpenNebulaApp features, so stay tuned for useful and awesome new features for the 4.2 release of the Apps. There is also a huge amount of work devoted to the upcoming 4.2 release. We held a public IRC meeting to define the 4.2 roadmap, to discuss the requests for new features and for extending existing features. Multiple changes are being carried out in the VMware drivers, aimed to give more control over VMware resources, and a more fine grained management of VMware virtual machines. Special attention is being paid to the storage backend option for VMware, polishing existing combinations and dropping some of the less used ones. Also, synergies and potential integrations are being explored between OpenNebula, Foreman and Puppet. Moreover, new drivers to interact with Xen 4.2 are being developed. These will enable the use of new Xen features like VHD images and a more tight HVM integration. A new virtual router is available in the marketplace, featuring a smaller image size and providing routing, port forwarding, dhcp, radvd and dns server functionality. The OpenNebula community is as vibrant as ever! Check out this amazing post where an community extension is explained (including a very nice video), which enables Infiniband interfaces in KVM virtual machines. Thanks David, fine indeed. Former ONEr Hector San Juan updated the VirtualBox drivers for OpenNebula, very useful for sandboxing and development environments. If you are interested in giving a talk or attending the conference, now is the perfect time!